Working areas should always be properly planned and organized at all times. Organization in the work place often reduces confusion and increases productivity. The best way for management to enhance proper organization and planning in the work place is by effectively communicating to its workers. There are very many ways in which workers can communicate with one another. The type of communication used greatly depends on the type of message being conveyed. You can use signs to convey informative messages or you can use labels and markings to send out a warning message. often used to send out both informative and warning message. You should note that a single pipe can have more that one pipe marking label on it depending on its content. 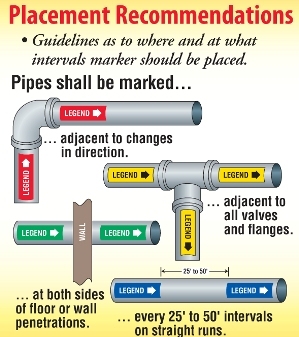 The message on the pipe marking label should be well understood in order to avert any danger and that’s why it’s important to educate your workers on the different pipe marking labels and their meaning. This is very important since a lot of people actually don’t understand the meaning of pipe labels. A passer by who works in an office will probably not know the difference between the colors used for toxic and flammable substances. That’s why it’s equally important to add words signs to support the type of message you are trying to convey. You can always put up a signs that says ‘WARNING’, ‘BEWARE’ or ‘STAY OUT’ just next to you pipes. Pipe markings labels are not only restricted for commercial use only. They can be used for residential purposes to help family members identify various pipes and their usage. Your house will be well organized if you have pipe marking labels. It’ll also be easier for you to do your household duties if you have general information on the content of certain pipes. Pipe marking labels are particularly important at home since a lot of pipes often have a similar appearance. It’s very possible to find pipes that are of the same color shade and size but have different content in them. This can be very dangerous if not disastrous especially if you have someone who has no clue. Pipe marking labels are a good way of getting rid of all this confusion and restoring order and sanity in your home. Make sure that the pipe marking label that you use is of good quality. They should be resistant to heat and any other corrosive liquid or material.